Decorative pet gates provide barriers to keep your pet from having free run of your house. There are times when you might wish to confine even the best-behaved dog to a single room – such as when a repairman is needed or when guests with small children visit. A barrier gate can keep your dog from having access to rooms where there might be items that can be knocked off and broken. It can also keep a puppy confined to uncarpeted areas during potty training. It can allow your dog to see and hear what is going on when there are guests without encouraging mingling that could have problematic results. Although your home might have rooms where the door could be closed to keep your dog inside, doors also limit air flow. If you have central heat or air, this could be a seasonal problem for your dog, who would feel the heat or cold if the room were closed off. Barrier gates also promote indoor air circulation, which can help prevent moisture build-up and odors. 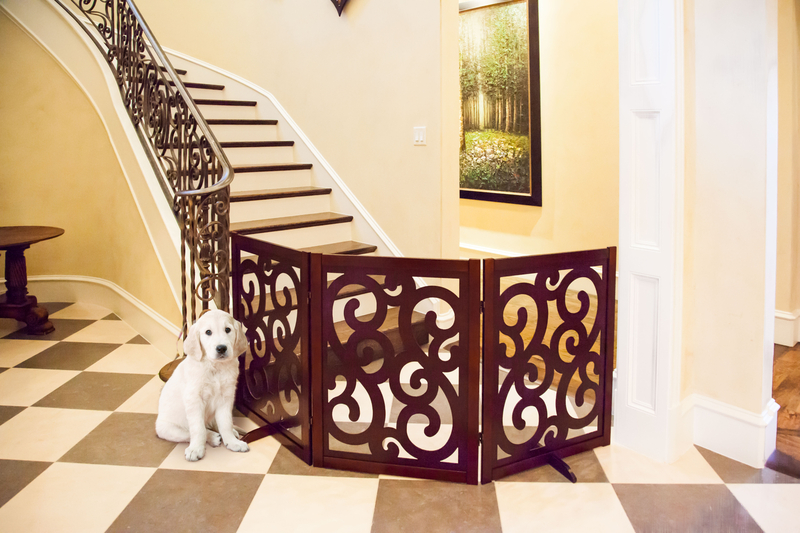 Barrier gates are a healthier solution than crating, especially for extended periods. They allow your dog to roam freely within an area, access food and water, and could even allow your pet to have a potty patch or piddle pads for those times when you just cannot get home in time. This is especially helpful for puppies or older dogs that have trouble waiting for you to take them out. Decorative pet gates can be a beautiful part of your home. They don’t need to be a clunky, ugly item. Some are free standing, while others can be installed with tension. A few do require permanent mounting to be effective, especially if you have a tall, strong dog who might challenge a free-standing barrier. Metal gates might be best for young dogs or for dogs that tend to chew when nervous. Always check to discover the type of paint used on gates, and seek out non-toxic paint types. The kind of gate that will work best for you is one that will effectively restrain your pet while blending with your décor. Fortunately, there are many selections from which to choose. Enjoy a classic designer pet gate from Primetime Petz. The three-panel folding gate is free-standing and portable, making it suitable for almost any space – no installation necessary. It goes well with almost any décor so you can keep your pet safe without sacrificing the appearance of your home. Rubber pads on the legs to prevent scratching. Not chew proof. Fun paw print design three-panel pet gate that can be free standing or mounted. It has patent-pending swivel feet that allow it to be fully extended without tipping. The three-panel fold and go design make it a good choice for traveling or visiting. No extensions are included, and it is not chew proof. Keepsafe wooden expansion pet gate is wall mounted and fits most standard doorways. Recommended by many major kennel clubs, the uneven top discourages jumping because dogs do not see a “jump off” point. The easy open gate design allows one-handed opening and closing. The gate can swing to one side or be folded back out of the way when not in use. You don’t have to wait for your own house and garden to have the white picket fence. This folding panel gate will perk up your home décor and can be folded and put away when not needed. It is free-standing and does not require nails or screws to install. No expansions available, and it is not chew proof. Dome top, natural wood picket fence three-panel gates are charming with any décor. They have swivel feet to help prevent tipping when they are fully extended. No extra panels, and not resistant to chewing, they are suitable for adult small dogs. Excellent choice for visiting or travel, and doesn’t require screws or nails for use. The all steel construction Hansel Emperor Rings pet gate from Murphy Pet is the perfect answer for the doggie that chews when nervous. The gate uses expansion technology to wedge firmly in a standard-sized door where your dog can see you but can be protected from activities on your side of the gate. No nails or screws required, but no added panels either. When ordinary pet gates are just not tall enough, this three-panel walk-through steel construction expansion gate could be just the ticket. This offering from Tucker Murphy Pet could be the answer to your big baby who finds it difficult to not share everything that you do. It does require hardware mounting, but the beautiful bronze finish goes with almost any décor. This Palm Springs designer gate from Primetime Pets is an easy travel or visit gate, ideal for on-the-go pet parents. The charming design and white color go with almost any décor. No extra panels, and not suitable for chewers. However, it is an excellent choice for older small dogs who need a little privacy and space from guests. Three hinged wooden gate panels, with Elton design from Murphy Tucker Pet. No floor protection included, and cannot be locked into a single line without tipping. However, it is beautiful and can be set up easily and quickly to provide a barrier. Needs to be braced against a wall for stability, and it’s not chew proof. Elegant three-panel pet barrier with decorative wire centers. No screws or nails required for installation, the three panels can be set up in a Z or C formation. Not resistant to chewing, but over-all suitable for most types of pets, especially dogs or cats. It’s easy to set up and folds for travel or to be put away.